After more than seven decades on the seabed off the coast of England, the remains of a German World War Two bomber are now undergoing conservation work in the Midlands. Experts are cleaning up the wreckage - which they say is in remarkable condition, considering its fate. Video. A rare warplane, raised from the seabed off Kent last week, was back in the air - briefly - today. The World War Two Dornier 17 - a German bomber, shot down more than 70 years ago - was lifted by crane from a barge to a lorry. It's being transported to the RAF Conservation Centre in the Midlands. Sunken WWII German bomber plane salvaged and now ashore, but what happens next? A World War Two German bomber that was raised from the sea off the Kent coast on Monday 10th June 2013 has been brought back to shore. The Dornier 17 aircraft lay underwater for more than seventy years. Staff from the RAF Museum have said the plane is remarkably well preserved with the tyres still inflated, the engines and propellors in good condition, and the bodywork still intact. Our reporter David Johns spoke to David Keen from the RAF Museum about the salvage operation, the significance of the plane and what happens next. The RAF Museum has been posting images of a salvaged German bomber plane that has been raised from the sea off the Kent coast. 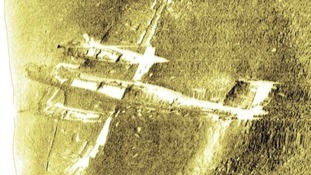 The Dornier 17 aircraft has been under water since World War Two. It has been underwater for the past seventy years. ETA for #Dornier17 arrival at Ramsgate is still 3pm. We will be there, tweeting live pics. Staff from the RAF Museum has been posting live updates on social media about when they expect a salvaged German bomber aircraft from WWII to be brought in to shore at Ramsgate. The Dornier 17 has been under water off the Kent coast for more than seventy years. The journey to shore for a Second World War bomber raised from the seabed off Kent has been delayed. The team that pulled the Dornier 17 out of the water near the Goodwin Sands yesterday, is now trying to collect more wreckage before coming back to shore. Video: The German Dornier bomber is raised from the bed of the English Channel after more than 70 years underwater. The Dornier bomber, shot down over the Kent coast more than 70- years ago, has been raised from the bottom of the English Channel. It is believed to be the only intact example of its kind in the world. The Dornier was salvaged by the RAF Museum from the Goodwin Sands. Strong winds have hampered previous attempts to raise the aircraft. After a two-year restoration project, the Dornier will go on display at the RAF Museum in Shropshire. Marine archaeologists will attempt to raise a the only surviving German Second World War Dornier Do 17 bomber from the English Channel later. Bad weather has hindered attempts over the past week to raise the fuselage from the waters at Goodwin Sands, off the Kent coast.